You're Jill of the City, an enslaved adult female! Escape the evil city of enslavement with the assistance of Wrangler denim and shoes! Should have named this Jill of the Concrete Jungle. Edit: Just played this. I really like how you have to upgrade your run and jump stats by collecting items, and how some of those items are tucked out of the way (the floating jeans), making the game more interesting and less straightforward. 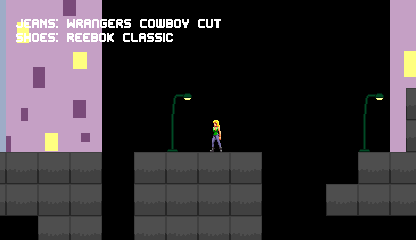 It's like a less blatant Metroidvania. The in-game advertising is kind of painful however. Thanks! 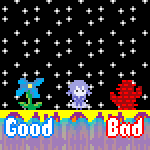 It's an idea I've been playing with (I had 5% of an "evolution" LD48 working with the same basic concept) for a while, and one I think I might try to really do something with some day. I feel like my level design here could've been a bit smarter, but I'd only granted myself Trainwreck time to make this. The in-game advertising, of course, I'm afraid, is the entire justification for the game's existence. I made it in response to a spambot! FUN FACT: the better upgrades are more expensive IN REAL LIFE. Because $$$ = power! It's like digging back to 1992! Jill of the Jungle in modern times. This girl had faced so much, but being here it was probably her best adventure.. Listen to those sound effects.. I had wanted to make a track with a Vangelis game. I was typing that out and I'm not backspacing it! No really, this is some amazing stuff. It takes you back, or me at least. Who says a lady can't slay a few monsters?